Police Quest casts the player as Sonny Bonds, a 15 year veteran police officer in the fictional town of Lytton, California. Assigned to traffic duty, Sonny investigates what appears to be a simple car crash but turns out to be a homicide. Sonny continues to give a traffic violation citation, single-handedly face a tough gang of drunken bikers, and make a DUI arrest. As the game progresses, he goes from patrol to temporary narcotics detective and finally takes on an undercover operation, tracking "The Death Angel", a murderous drug dealer named Jessie Bains. Sonny is assisted by "Sweet Cheeks" Marie, his former high school sweetheart who is now working as a prostitute. Jessie Bains' drug business has found its way into Lytton's school and one of the victims of an overdose is the daughter of Jack, a colleague of Sonny at the police department. 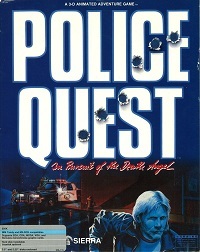 Written and designed by retired police officer Jim Walls, Police Quest was one of Sierra's first games which aimed to achieve authentic realism, making the game quite different from other classic Sierra adventure games where the task was to rescue damsels in distress, defeat evil wizards or save the universe. Police Quest was in fact so realistic that it was used as a real police training tool. The game comes with an indoctrination guide with police codes and procedures. This game was made with Sierra's Adventure Game Interpreter engine (AGI), using text parser and was released for the IBM PC, Apple II, Amiga, Atari ST and Apple IIGS. It was remade in 1992 with 256-color VGA graphics and the SCI1.1 engine.